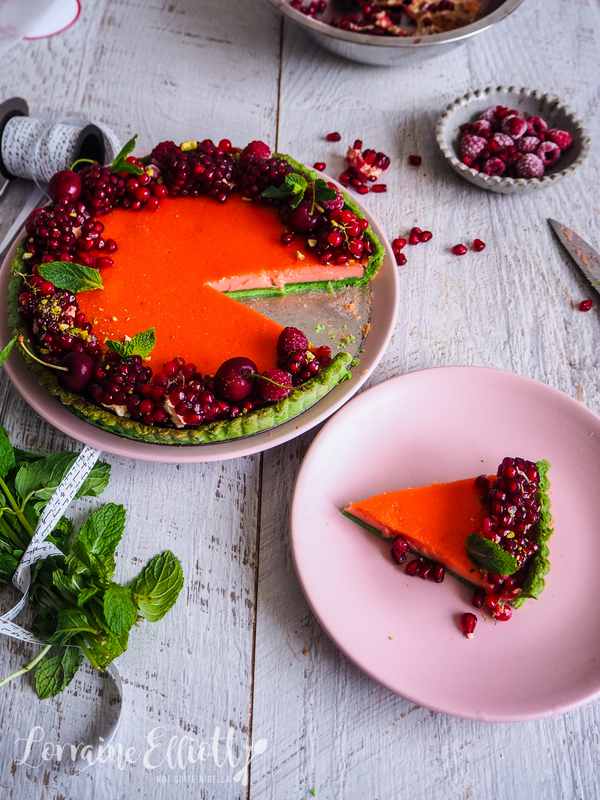 If you want something gleaming and glorious to serve up at Christmas that is best baked beforehand, then take a peek at this pandan, raspberry and pomegranate tart! 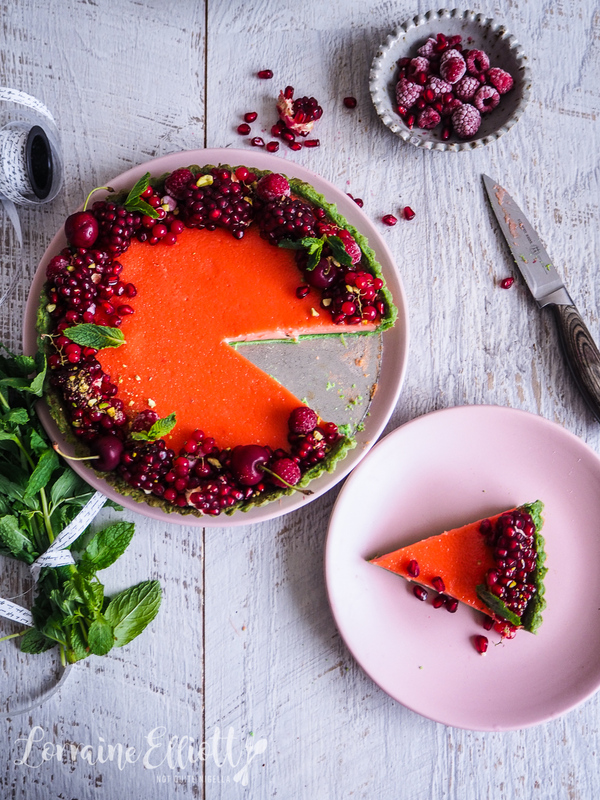 With creamy, wobbly raspberry custard, a crisp green pandan pastry and decorated with fresh pomegranate and cherries as well as redcurrants and raspberries, this green and red tart is certain to delight. I've said it many times but pastry is a weakness of time, especially when paired with creamy, soft custard. 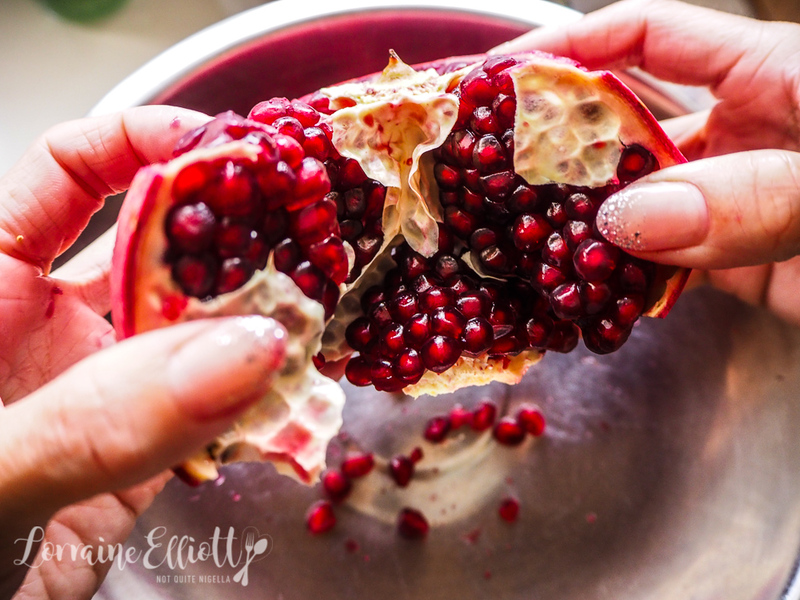 Not only do you get flavour but you also get textural contrast. 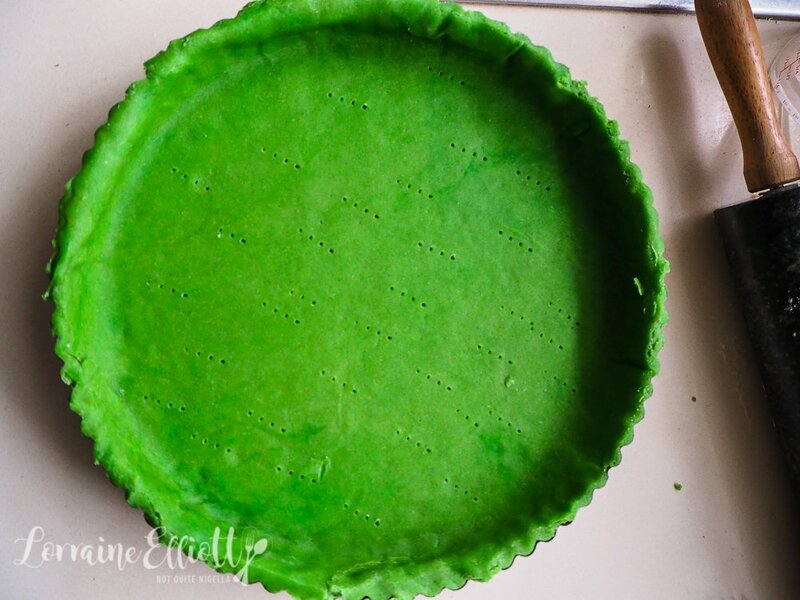 And while I will admit that the pastry is fiddly as it is made from scratch (you could also use a frozen pie crust, no judgment here) home made is probably the only way that you'll get this red and green Christmas effect. 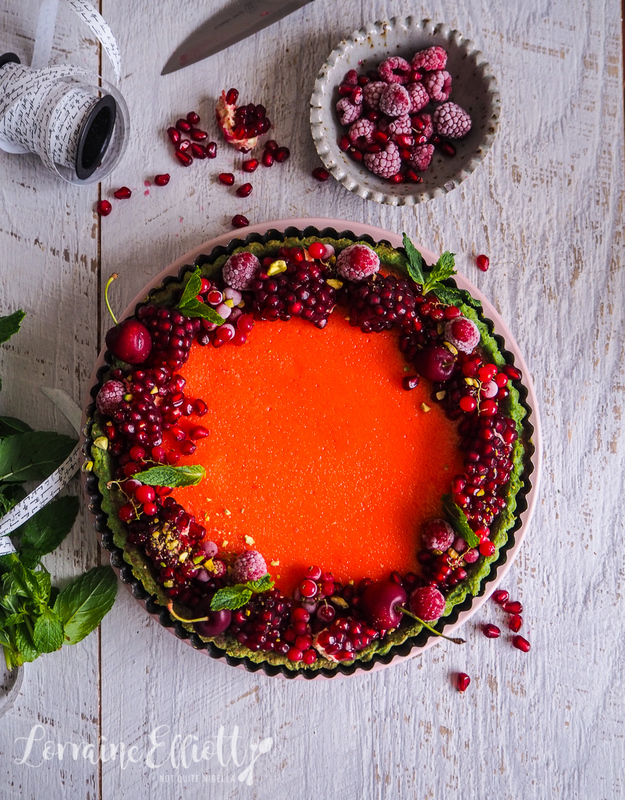 I had no intention of baking this tart. Mondays are usually quieter days for me, usually catching up on editing and writing stories from a busy weekend. But this past Monday two days ago I woke up to some messages from my mother. I saw a preview of them flash up and my heart skipped a beat, "I've been trying to call. Your father has..." showed. At 2am my father had suffered a stroke. He was rushed to the ICU and remained there. We went to visit him that morning. Hospitals are confusing places especially for people with no sense of direction. I was lucky that Mr NQN stayed at home to work and took me there because I don't think I would have found him in my confusion. My normally neat and always groomed father looked askew, as if a wind tunnel had gotten a hold of him and he lay there, a glowing finger reading his pulse. He looked at my blinking, not saying anything and I wondered if he recognised me. A lovely nurse explained how he was progressing. Despite his protests my mother had insisted that he go to the hospital and I think that definitely was in his favour. His speech was affected but he was able to move his body and wasn't paralysed. The nurse asked if we could ask him questions to get his speech going again because he didn't seem very chatty. Mr NQN piped up that my father is a man of very little words already so the nurse shouldn't take that personally. We asked him some basic questions. "What is her name?" the nurse asked him pointing at my mother. He answered, "Elliott". "What is my name?" pointing at me. He answered correctly. "What is his name?" I asked pointing to Mr NQN. He answered a friend of his who had passed away. "What is my dog's name?" I asked to which he looked confused. "What dog?" Then my mother thought about it for a second. "What is their cat's name?". He always calls Mochi a cat even though she is clearly a dog. And he answered straight away, "Mochi". This made him smile. In my entire life I have never seen my father laugh out loud. The most that I have ever seen was a smirk and he gave us one then. At the moment, it is a waiting game. My sister flew home from London early to be here and he has now been moved to the stroke ward where he will remain for about a week. We hope that he will make a full recovery. And when we left him he was busy raising his legs, wriggling his feet making sure that he wouldn't lose his mobility and independence. And I bake because I don't know what else to do. I baked his tart, I roasted some lamb, I made some rocky road and fudge and made jam. I kept busy because I needed to and baking is incredibly soothing to me and gives me such grounding pleasure. So tell me Dear Reader, how do you cope in times of stress? 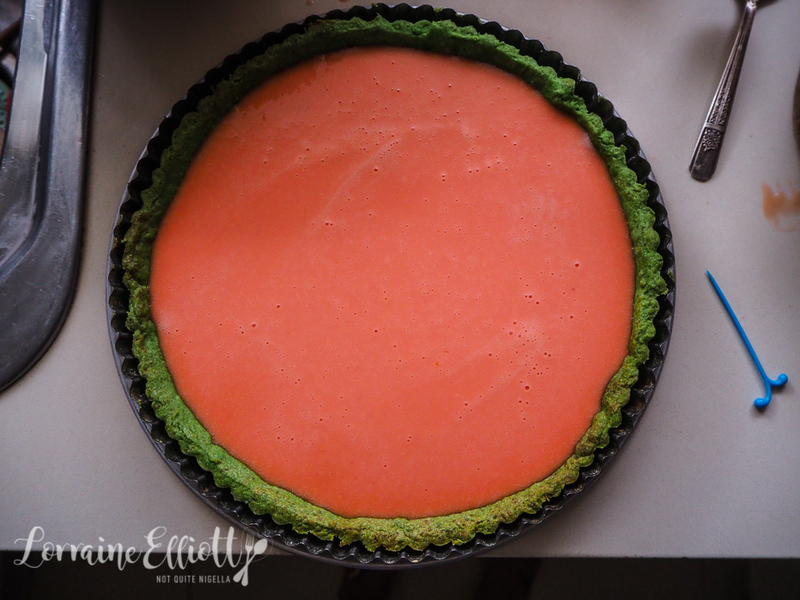 Step 1 - Grease a 23cm/9.2inch loose bottomed tart tin. Place the flours and sugar in a food processor and pulse to combine. Then add the butter and pulse until the mixture resembles sand. 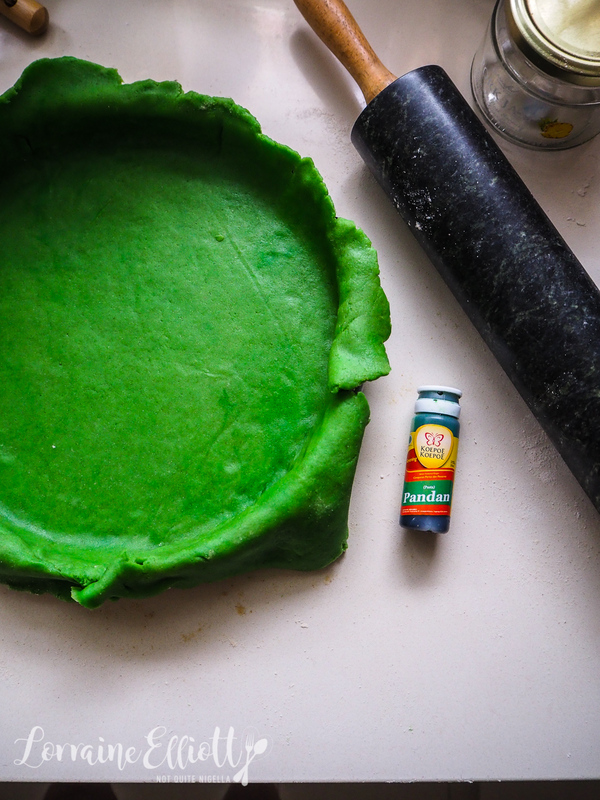 Stir the pandan essence into 4 tablespoons of water and then add to the flour mixture and pulse until just combined. Step 2 - Knead on a clean surface. I find that gluten in spelt flour means that it doesn't become too tough to roll which is why I like using it in pastry. I roll it out straight away and then place it in the pie tin and press down the edges. Leave a bit of overhang and refrigerate for 1 hour. Step 3 - Preheat oven to 200C/400F. 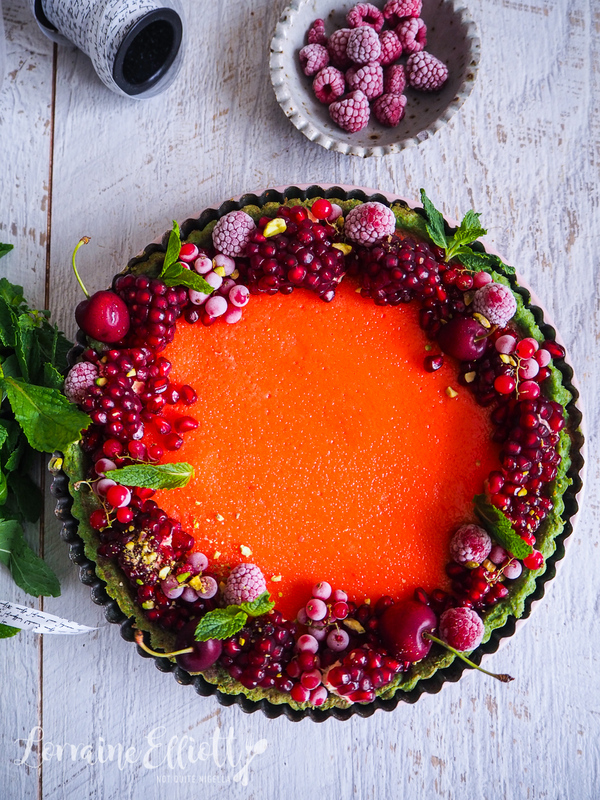 Trim the edges off the tart and dock with a fork (I made jam filled tarts topped with fruit with the extra pastry). Bake for 20 minutes or until the base is cooked through. Cool and reduce temperature to 120C/248F. Step 4 - Whisk the cream, sugar, puree, eggs, egg yolks and colouring together. Pour into the cooked base and skim off all the bubbles. Bake for 35-40 minutes or until set. Cool. 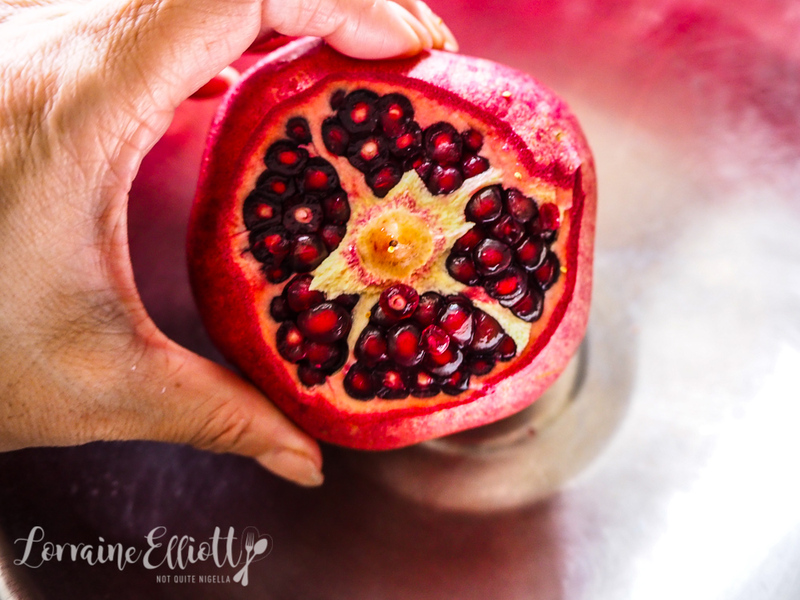 Step 5 - Cut the pomegranate open and decorate with pomegranate clusters, red currants, cherries, raspberries, fresh mint leaves and crushed pistachios. 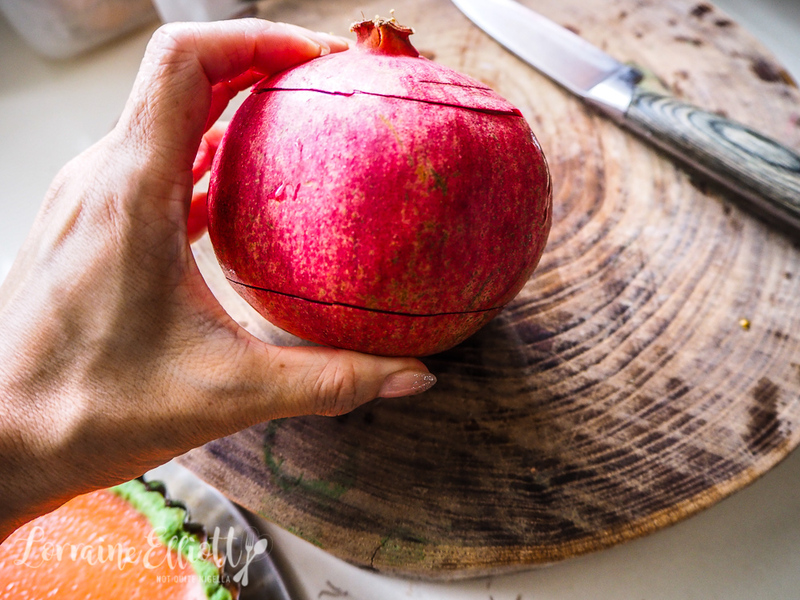 Make a circular cu across the top and bottom of the pomegranate as shown. You can now see the segments of arils. Cut along the white part vertically at one point. 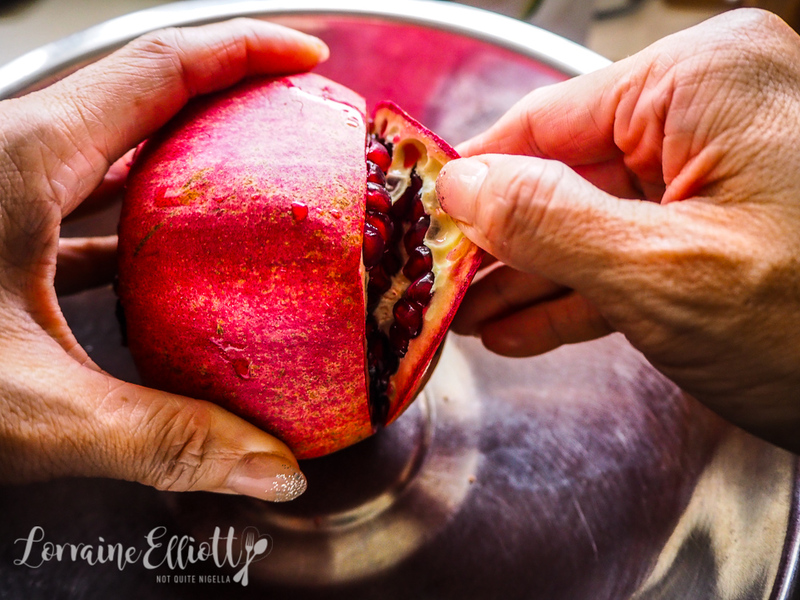 Then pull apart the pomegranate. The arils will stay mostly intact and will be less messy to deal with. recipeThe Best Ever Chocolate Fruit Mince Tarts & Win a Woolworths Gold Goodie Box! 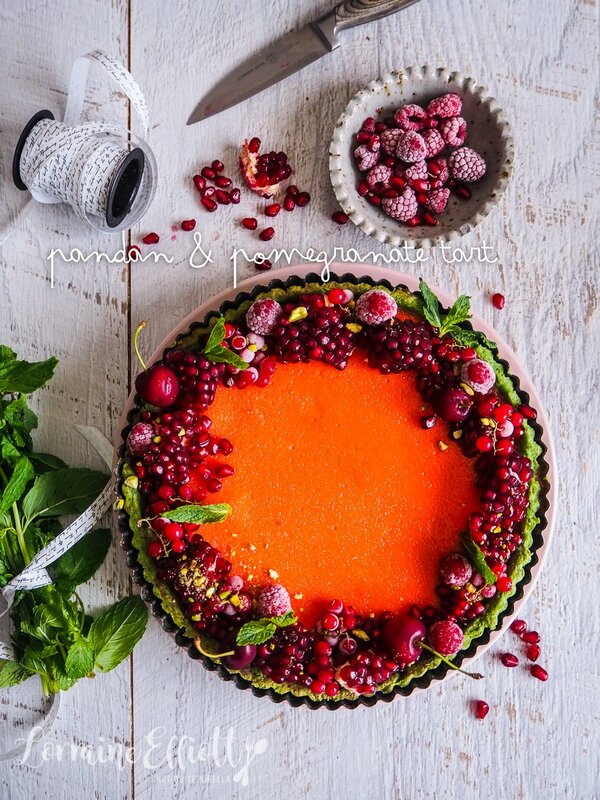 recipeA Dessert for Summer and Winter: Pineapple Tarte Tatin! 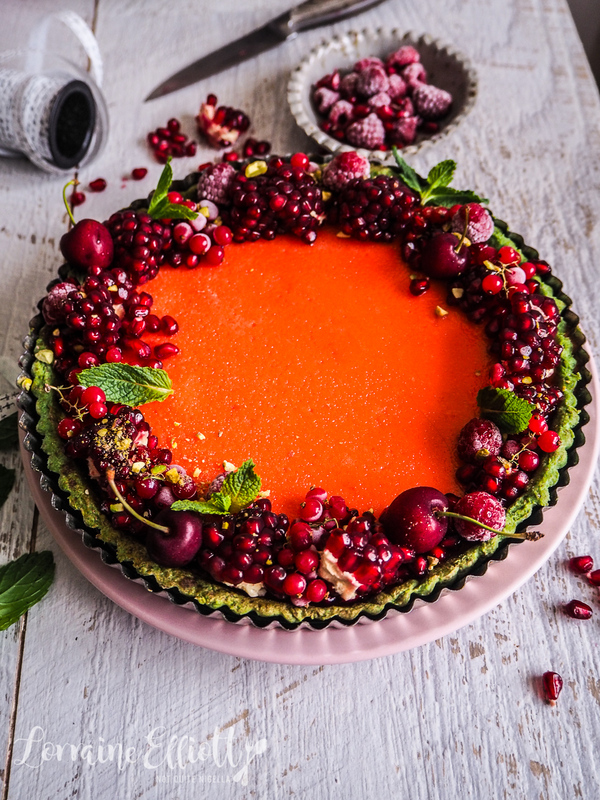 recipeIt's Going To Get Dirty In Here: Triple Layer Chocolate Pumpkin Pie! recipe The Best Ever Chocolate Fruit Mince Tarts & Win a Woolworths Gold Goodie Box!